Just over a week ago two Collared Lizards were rescued after being abandoned outside in the cold with their tank and no heating and would have surely perished if they hadn’t been rescued. The GSPCA Ambulance Wardens went out to rescue and collect the lizards and on arrival it was apparent they weren’t well. Once in the warm and provided with food their condition improved but after a closer veterinary examination there were real concerns for one of them. Mexico on entry weighed just 30g looking very thin and Oklahoma 34g very bloated. Have you lost a dragon in Guernsey? 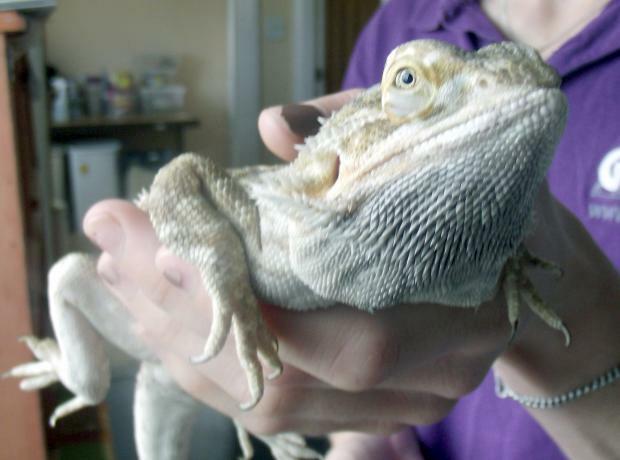 The GSPCA are currently looking for the owner of a lost dragon, a Bearded Dragon that is! The Bearded Dradon now fondly called Sorrento by the team at the Shelter was found near Collings Road. He is currently in a vivarium at the GSPCA and if you have lost yours please get in touch on 01481 257261 or pop into the Shelter in St Andrews.